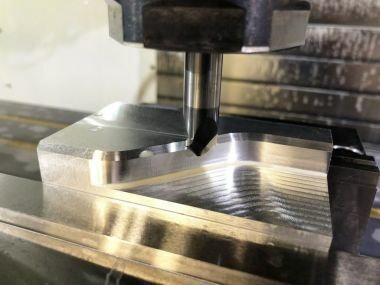 Scientific Cutting Tools, Inc. has announced a new line of high-performance helical chamfer mills. The helical cutters are significantly freer cutting and leave a smoother finish than the standard straight flute alternatives. The variable helical flute design provides high sheer, reduced side cutting pressure, and improved chip evacuation, thus achieving extremely high performance. Made from premium sub-micron carbide, the tools are manufactured in both three flute and five flute versions to address a wide variety of materials. The three-flute design is ideal for softer materials while the five-flute design performs well in harder materials. Helical chamfer mills are made on CNC tool and cutter grinders to exacting tolerances. Sizes range from 1/8" to 3/4" cutter diameters, and come in 60, 90, and 120 degree included angle configurations. The front of the tool is ground flat and the tip diameter is held to + or -- 0.002 inch tolerance to provide ease of set-up and accuracy in programming. In addition, the small tip diameters allow for maximum machining flexibility.